Has removable ping pong table on top; with paddles and balls. 440-square-foot wooden deck affords views of the water. Flagstone patio on the opposite side of the house near the main entrance is shady in the afternoon. Amazing location, luv'd kayaking and swimming in the lagoon! Best part of the day was having morning coffee on the deck overlooking the tranquil water. I would high if highly recommend! Thanks for letting us stay at your amazing place! Thanks so much for your glowing review. The location really is special and we try very hard to make the house comfortable and welcoming, but the natural beauty, abundant bird life and proximity to the tranquil waters of Lagoon Pond are the major attractions that we can't really take credit for. Glad you had a nice stay! Our family had a wonderful time here! Great accommodations and the pond was awesome! Our whole family immediately felt at home and comfortable. We loved being just steps away from the beach out back. At night, we took in the stars and the water from the inviting deck. We definitely recommend and hope to come back! This was our second year at this wonderful home on Lagoon Pond. Right on the water with its own small beach, this is a great spot for the family: the lagoon is perfect for kayaking, secluded and the water is very calm. 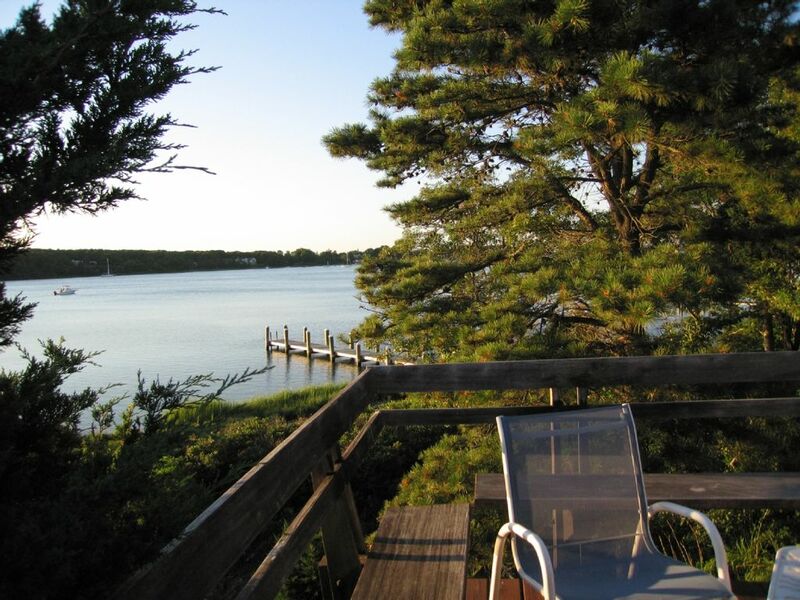 Great view of the lagoon, the surrounding area and delightful sunsets to watch from the porch. Located away from the crowds, but with easy access to Oak Bluffs or Vineyard Haven by bike or car to the north, and to the beaches and quiet areas up island. The owner and caretaker were both readily accessible and very helpful. Highly recommended! Our second year in a row staying in this beautiful home overlooking the lagoon. The place was as stunning and inspiring as we had hoped when we found it on this website. The grounds are well kept, the owners were welcoming and extremely helpful and Tom, the groundskeeper made sure the place was in great shape for our arrival. Our favorite activity was kayaking across the lagoon in the morning and we would recommend this property to anybody interested in a Vineyard getaway. So glad you had a good stay and enjoyed the house and grounds. Sadly, due to insurance issues, we are no longer able to provide kayaks for the enjoyment of our guests, but some folks bring their own or rent them once they arrive on the island. Once again we loved staying at Skid and Ann's Lagoon home. We had everything we needed. We created great meals in the kitchen, entertained friends on the deck, and slept like babies with the perfect breeze coming from the Lagoon at night. In the morning, the kids could get up and head out to the private beach, where I could watch them from deck with my coffee and my feet up. When it rained the kids could watch t.v. on the big flat screen while my husband and I planned our day. And man, that view! The layout was perfect for our family. Downstairs kids bedrooms, bathroom and ping pong table and slider to the outside (with out door shower) meant the kids could entertain themselves and be kids without tramping through the upstairs all the time. The upstairs slider to the deck meant we could eat meals outside and enjoy the outdoors as much as possible. House is clean, well maintained and as advertised. I did need to call the caretaker once about something minor (I forgot to order linens for our vacation--my fault) and he was incredibly responsive and helpful. Nice owners and nice place! Located just 7 miles off the Massachusetts coastline, the beautiful island of Martha’s Vineyard is a world apart, offering a vacation ambiance unlike any other. Explore the diversity of the six island towns, take long walks along the pristine shores, and step back in time to a more leisurely pace. Each season offers something different. Easy on-line payment through PayPal: Visa, MasterCard, American Express, echecks, or bank transfer In addition to the $200 cleaning fee, renters will be responsible for cleaning fees in excess of that amount if the property is not left in broom-clean condition, as stated in the rental agreement. $1,000 damage deposit is required. If no damage, deposit will be returned within 6 weeks of move-out.